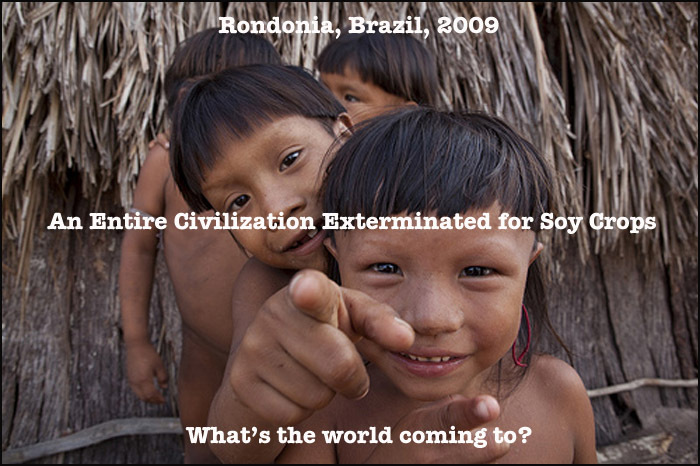 Entire civilization wiped out for soy crops! Most American families will celebrate the holidays with certain traditions. We'll gather together and have a special meal, perhaps sing some songs and we'll hear about who is doing what. We will also think about those members of our family that have passed away. There will be some crying, but mostly it will be a fun time. It's important to remind ourselves how miraculous it is to have a family. In the genetic sense, it means that an unbroken lineage has extended back through many generations -- surviving such things as wars, diseases, famines and accidents. If you really think about it, our families go back hundreds of thousands of years. That's how far back we can all trace our genetic lineage to the "mitochondrial Eve," the first homo sapiens. Now think of how horrible it would be if something were to wipe out an entire family. How terrible it would be to have that long lineage of thousands of generations to abruptly end because of something relatively insignificant. The picture below is of a family -- a tribal family in the remote jungle of Western Brazil. Look at them. They are gathered together to celebrate their holiday. But they don't have much to be happy about. They are the last five survivors of their tribe and they will soon become extinct. At the time this picture [above] was taken there were just five remaining survivors from an original group of about 7,000. They called themselves the Askuntsu and they made their home in a remote part of the Brazilian Amazon call Rondonia. For thousands of years the Askuntsu have enjoyed a simple life in this garden and no contact with the outside world. They wore no clothes and did not know the meaning of shame. They respected their environment and revered its ability to feed and protect them while they went about raising their families doing their daily chores of hunting, gardening and preparing food. It was a kind of Edenic life, free from want and largely based in the present tense. But that ended about a decade ago. The "outside world" lives for the future. It has many wants and needs. It has also lost contact with the natural forces that regulate growth and maintain a balance between the resources and the environment. The outside world chooses to live in crowded cities and uses money to buy what it wants. And it wants beef. Bending to the demands of their rapidly growing population, Brazil opened up the remote Amazon land to huge agricultural and mining corporations. With some government help, these corporations first carved railways through the dense jungles. These were followed by a major highway, BR-364, which allowed heavy equipment and trucks to penetrate the dense jungle. Next the unemployed city dwellers quickly followed with their dreams of easy money and good wages. Rondonia is one of the last frontiers, being on Brazil's far west border with Bolivia. And it's also the last unexplored wilderness where indigenous tribes, like the Akuntsu, were peacefully living and thriving in their timeless co-existence with nature. Before our "outside world" penetrated to Rondonia, we had encountered other isolated tribes in the world. The Europeans encountered tribes when they colonized Africa. Then there were the Indians who were already inconveniently living in the North American continent that was supposedly "discovered" by more Europeans. Sadly, these encounters didn't turn out very well for the indigenous people. Within a few years of their encounter with the pilgrims, over 90 percent of American Indian tribes were wiped off the North American continent. These acts of genocide are condemned by everyone. The Brazilian government knows that genocide is wrong. 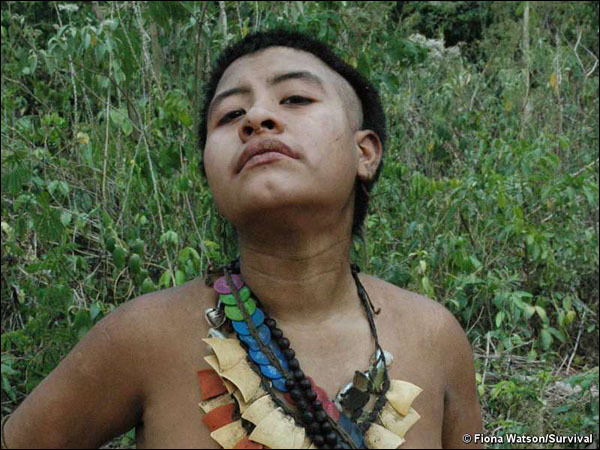 After the first encounters with Amazon tribes they established laws to protect them. A special bureau of Indian Affairs (FUNAI) was established. When a tribe was encountered, they would set up a preserve where any impact on their environment would be prohibited or severely limited. At least that's how it was proposed. But, as he Akintsu learned, the devil is in the details. As the ambitious workers flooded into Rondonia's lush jungle, they cut and burned the trees, exposing the thin layer of soil to the elements. They planted soy beans to feed cattle and quench the "outside world's" taste for beef. As the fragile land lost its fertility, they used fertilizers and pesticides to extend their viability -- inevitably giving up the exhausted land and moving deeper into the jungle, where the process of defoliating would continue again... and again. Satellite images clearly show the devastation as lush green patches of virgin jungle are scarred by raw earth in clearly defined rectangles. It's like a cancer eating away all plant and animal life. These scars will remain as the valuable topsoil has forever been depleted. It didn't take long for small towns to appear in Rondonia. Then larger towns, like Corumbaria, developed along with the agricultural economy. People started building houses, schools and churches. Soon their were governments, politicians and police. Their lifeblood was the agricultural development; they all knew that. Then it happened. The Akuntsu tribe numbered 7,000 people. We can only guess what they thought when they heard the chainsaws and bulldozers cutting down their jungle. Who were these people with these loud machines? Why were they destroying the land? Representatives from FUNAI encountered a small group of Indians in the south-east corner of Rondonia in 1995. By then the large agricultural and cattle ranching farms had been well established. These Indians kept telling stories of a large tribe that lived nearby, but the FUNAI workers never encountered them. Then, upon investigating traces of old huts, gardens, meeting houses and pottery, they found the tribe -- massacred. By the time the "outside world" spotted the Akuntsu it was too late -- too late to stop cutting the trees, too late to stop the expanding soy farms -- and especially too late to inform the Brazilian government that an uncontacted civilization existed. It was inconvenient for everyone and so the Akuntsu were simply exterminated -- all but six people that is. 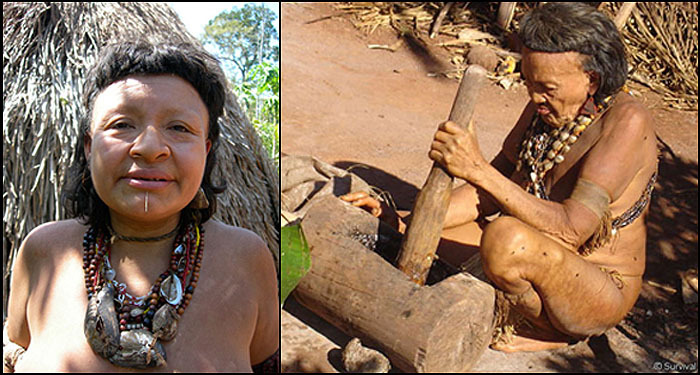 Rumors in the Corumbiara region told of the massacre of uncontacted Indians at the hands of gunmen employed by cattle ranchers. FUNAI found evidence of the massacre -- an entire Indian maloca had been bulldozed and covered with earth by ranchers in an attempt to hide the attack. The oldest member, Ururu [above], was among the six survivors of a massacre that killed thousands of men, women and children in their homeland of Omere, in the state of Rondia. The world has done little to prosecute those who committed this act. Sadly, Ururu passed away in her sleep in 2009. Now there are only five. 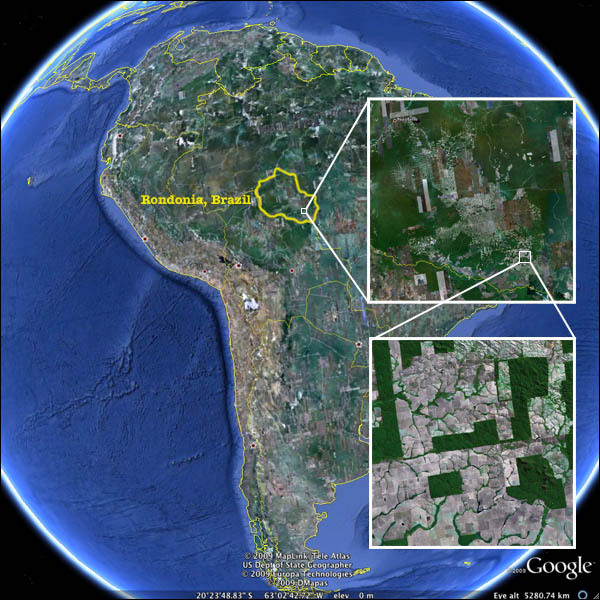 I know there are two sides to every story, so I contacted sources in Rondonia to get the other side. I was shown pictures of school children, holding up signs that read "Peace" and I was told by residents that they were ashamed about what happened. I was even told that it would and could never happen again. But then, on December 9th, 2009 I learned of more mysery. I was sent an anonymous e-mail with a link to a story. Two "peasants" who were supporting the rights of some remaining indigenous tribes in the region were murdered. Their bodies were discovered with signs that they had been tortured before death. Their fingernails had been pulled out and their skin had been cut off. This was clearly meant to be a warning against any further support for the existing local tribes. The report stated that the local police were investigating and that a security group, assigned to guard the agricultural developments, were the main suspects. These is the same group responsible for the massacre of the Akuntsu. Does this anger you? Just look at one of the survivors of this genocide [above]. Her name is Inutela. She's posing for a photograph taken by a photographer named Fiona Watson, who works for Survival International. She's wearing a necklace that was made from collected pieces of plastic pesticide containers. She doesn't understand that they are poisonous. She doesn't understand anything that has happened. Why was her family -- even small children -- all killed? Why are people destroying the wonderful jungle and making the land die? What could possibly be worth so much to make this happen? Although their land has been legally recognised and FUNAI maintains a permanent presence in the area, the Akuntsu are still surrounded by hostile ranchers. Some still have buildings, employees and herds of cattle in the Akuntsu territory. FUNAI is trying to expel the ranchers, and the case is now in the courts. In December 2009, gunmen -- believed to be these same ranchers -- launched an attack on the last survivor of an uncontacted Amazon tribe in a remote part of Brazil's rainforest. That's right. He's the LAST survivor of his entire tribe. 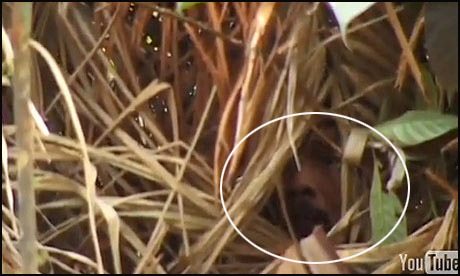 The tribesman, known as the "man of the hole" because of the pits he digs for trapping animals and because he stays in hiding, is believed to have survived the attack. The incident took place in Tanaru, an indigenous territory of Rondonia. Ranchers who oppose government efforts to protect the man's land were the likeliest perpetrators, said the Survival International group's director, Stephen Corry. "His tribe has been massacred and now the 'man of the hole' faces the same fate. The ranchers must allow this man to live out his last days in peace on his own land, and the authorities must do all they can to protect it." How inconvenient for the ranchers. As long as he stays alive they cannot take his land, burn all the foliage and use the soil for a couple of harvests of soy -- then move on leaving behind a sterile patch of dirt. Officials from FUNAI discovered its protection post was ransacked and found empty shotgun cartridges nearby in the forest. "This is a serious situation. The Indian's life is being put in danger by the interests of the ranchers," said Altair Algayer, a FUNAI official. Police have investigated the incident but, of course, nobody has been charged. The man's age and name is unknown, but he is believed to be the sole survivor of a tribe massacred by ranchers in the 1970s and 1980s. He traps animals by digging holes lined with spikes and, in the center of his hut, he has dug a hole in which he hides when outsiders approach. The site is surrounded by cattle ranches and soy plantations. It won't be long before he is gone. The "outside world" needs beef. Fleeting images of the man [above] were captured by the filmmaker Vincent Carelli in his film ‚ Corumbiara, which documents the plight of the Akuntsu and other tribes in the region. If this news make you upset, please see how you can change things here, and elsewhere. Go to SurvivalInternational.org for a list of things you can do right now! All this suffering in just that tiny speck of the Amazon. ne can only imagine the total mysery that exists in the world! All because we need beef... and other commodities. It is quite sad indeed. Especially when one thinks of how innocent and happy they once were. This is so much like the story of the Garden of Eden. I think it's a pretty good argument against eating meat. The suffering of the animals is just one factor. The people working with them also suffer and the environment suffers and lastly the people who eat the meat also suffer. This is no different to what the Europeans did to my people in America. You forgot to mention things like diseases which we had to immunity or prior exposure to. Thousands of my tribe died from the common cold and then were poisoned by smallpox infected blankets. We would never treat anyone like this. It is your culture (non-Native)that is guilty of these terrible things. Thanks for the article. I went to the Survival International site and wrote a letter to the Brazilian government. They just got the OK to have the Olympics in Brazil so they may be more receptive to helping these indigenous people now. I know I will feel different every time I east a product from the Amazon. This is happening in slow-motion in Palestine right now. Thousands have been massacred over a decade instead of all at once. Is it any different? I would hope that some international environmental group would stop these farmers because it damages the jungle and the change of carbon dioxide to oxygen from the many plants and trees. This is going to make everyone suffer - is it not? You say it is our planet's lungs. Why do we not save our lungs? And you say this can not be changed back even if they try to make more trees grow because the earth is now dead. This is very bad for our future and our children, is it not? I read this and think we are truly not good caretakers of our planet. I welcome some aliens or some outside intellect to take us over and hopefully rescue us from our own ignorance. Mankind has reached an all-time low in his quest for the love of money. Very, very sad to see this type of barbaric treatment of another innocent human being. How embarrassing to be a part of a race that will kill a fellow member over the love of money. UN-ACCEP-TABLE!!!!! Only then will you find thatmoney cannot be eaten. The Earth is slowly dying and If we don't do anything to stop this greedy people, who are destroying everything they get their hands on for the search of money, there would be nothing left in this planet, which would be worth leaving for. One more thing which you certainly forgot to add.. I believe it is a government behind it. If they want it they would put a stop to it long before the massacre was taking place and now its like they are WAITING for this last man to die, or be shot at, to take his land.